We've eaten out a lot this year, everywhere from Doonside to Paris, but nowhere excited us quite like The Burman Kitchen in Granville. Maybe it's because the flavours are new to us, we are yet to visit Burma, though we tried a couple of Burmese restos in Sydney that blipped in popularity before in imploding. 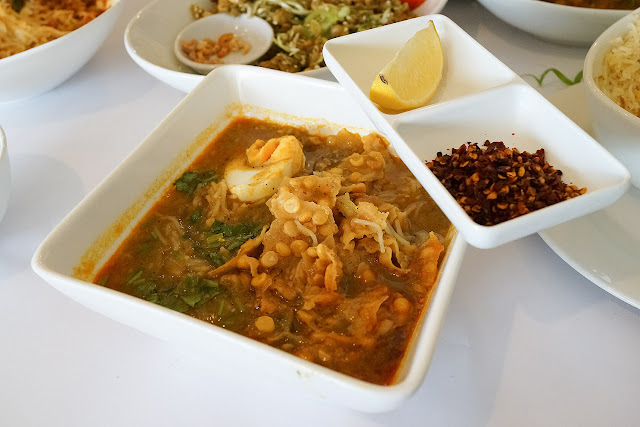 And we are yet to try Sun's Burmese Kitchen in Blacktown. But anyhoo... 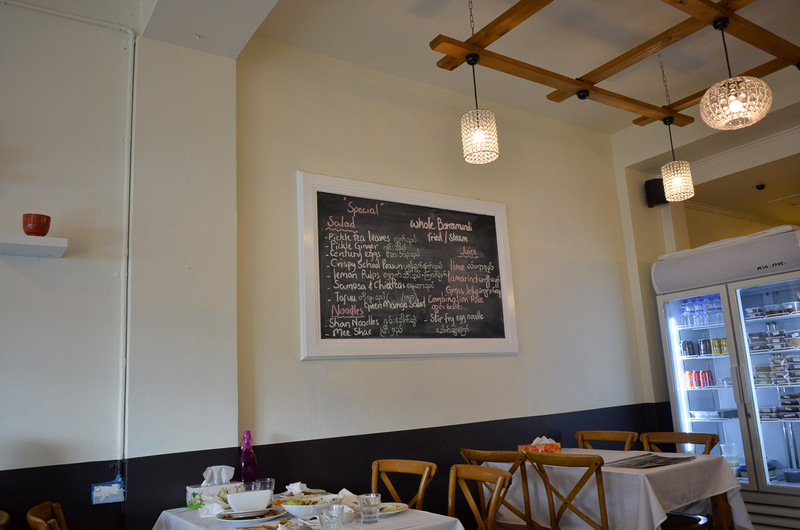 The folks at The Burman Kitchen have created a little bit of magic, a perfect mini storm of a pleasant space, a great cuisine, very friendly and engaging owners, and most important of all, some seriously fine cooking chops. These guys can really cook. The fitout is simple yet smart - it has the hole-in-the-wall vibe that we so much love, yet it's fresh and bright, and snazzed up a little with white linen\paper table clothes, and the right amount of knickknackery. We could bring our mums here. 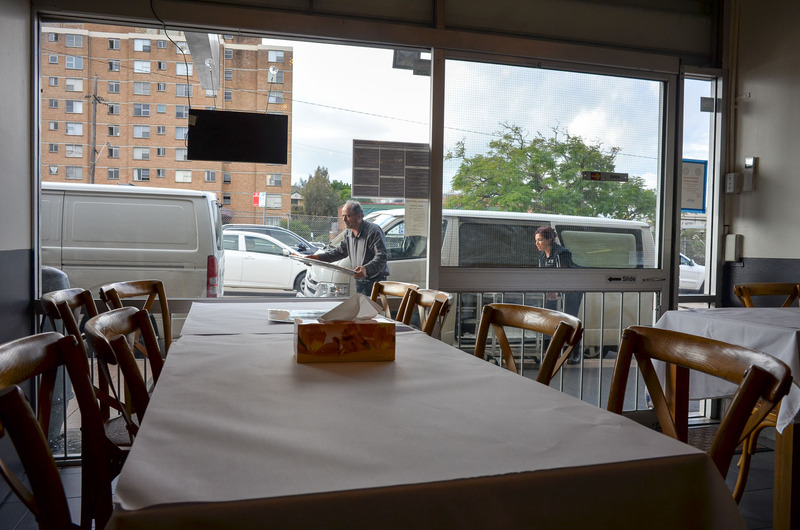 The Burman Kitchen is run by some of the nicest restaurant folks in Sydney. When there is a gap in the service the boss ladies come out to say hello and chitchat about the food. They are proud and very confident about their cooking, and rightly so, this is amazing food. 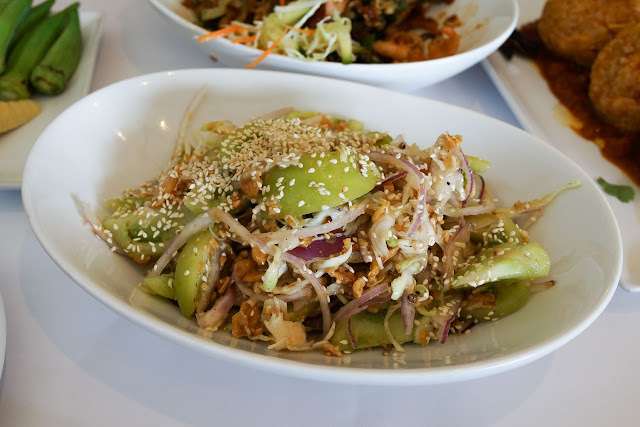 Most of all we love the salads which are a mix of fresh, funk and crunch, like a Thai salad, but kinda not. If we had any complaint about The Burman Kitchen is that it is too cheap. Seriously. Most dishes are $10 - we would rather pay a bit more to ensure these guys stay in business. If you feel the same way then do what we do - order some extra dishes and doggy bag the leftovers, and grab an extra curry or two from the fridge as you go. Everybody wins - the resto gets some extra dosh - and we get another 2-3 rather awesome midweek dinners, for little extra investment. 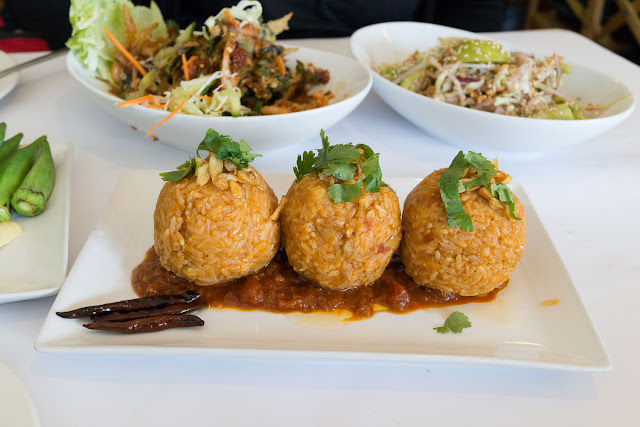 So yeah, The Burman Kitchen is new insta-favourite of ours, we'd put it in our top 5 Sydney restaurant list if we had one, just pretend we do. 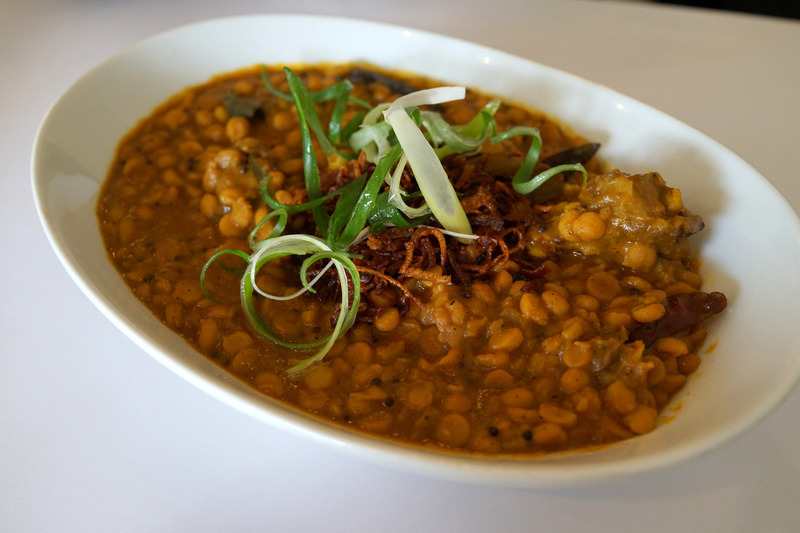 Spicy lamb and split pea curry - $15. 'Tender lamb chop and split peas with house roasted masala'. 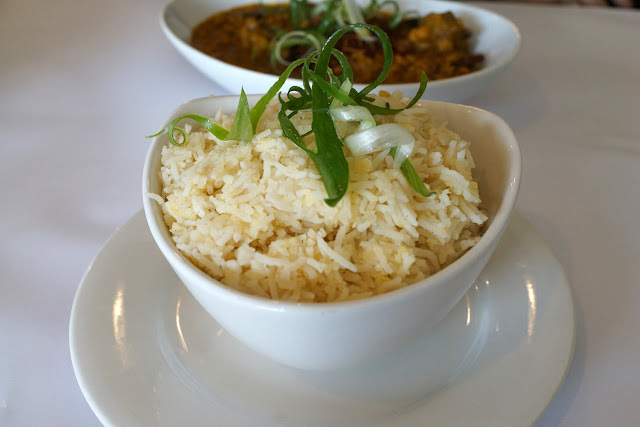 Butter rice - $5. 'Basmati rice steamed with butter and lentils'. Shan noodles - about $10. 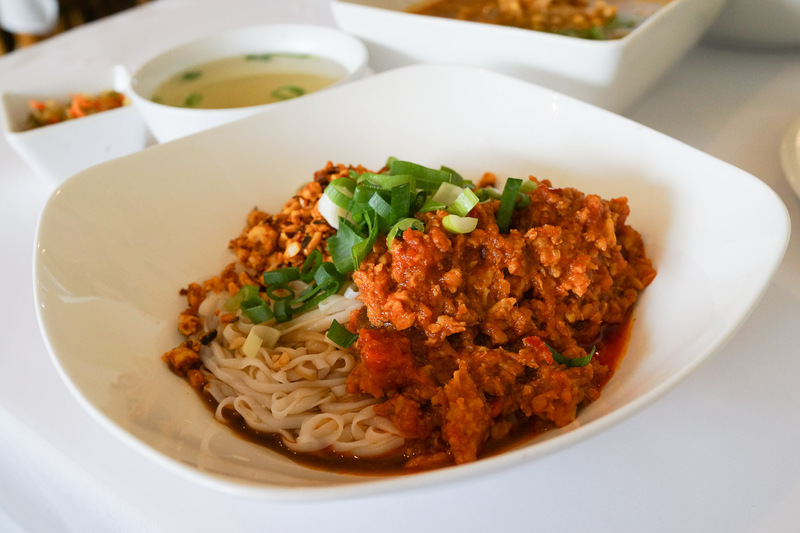 A classic dish of noodles topped with chicken or pork cooked in tomatoes. Pickled tea leaves salad - about $15. 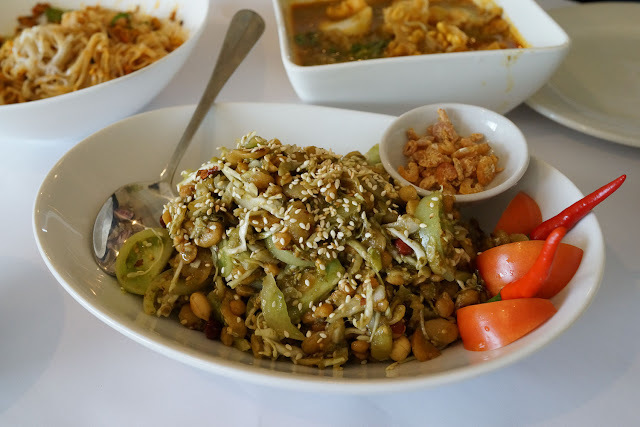 This is our favourite dish here - it's a taste and textural marvel - there's an explody crunch to the deep fried broadbeans and peanuts that works wonders against the the salad-y fermented tea leaves with tang and funk from tomato and dried prawns. Oh yeah. 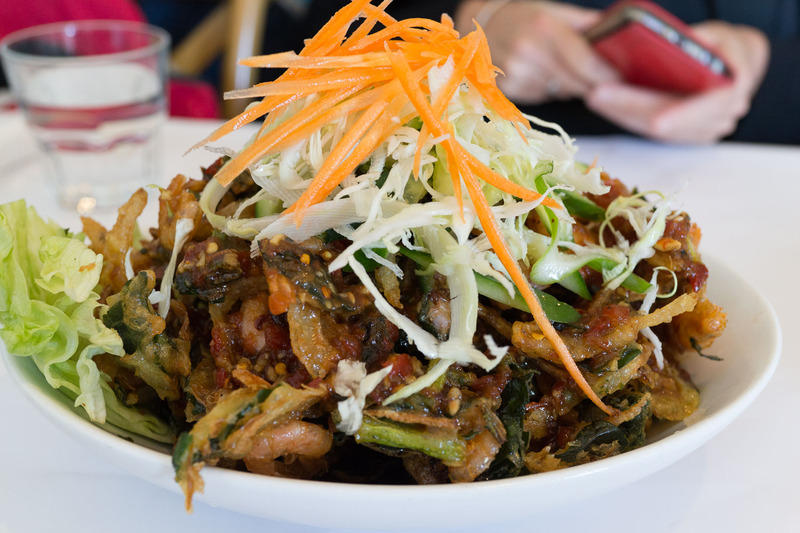 Crispy school prawn salad - about $15. This has the same fresh mixed with crunchy appeal as the tea leaf salad, with the crunch coming from little fried prawnies. It's a large serve that almost could have done us for lunch. Ngapi yea - $8. 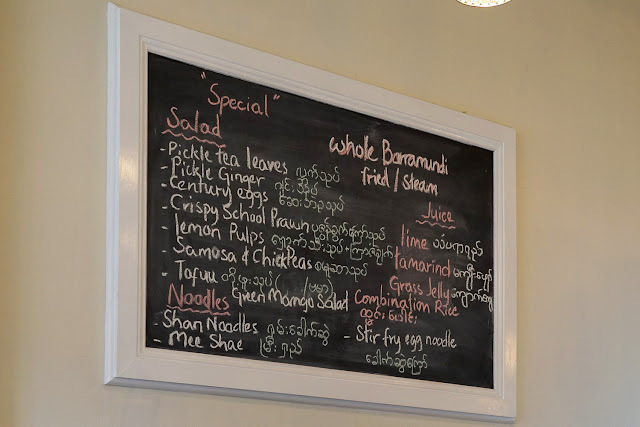 'Traditional Burmese fish extract served with fresh and steamed vegetables'. Both boss ladies stop by our table to yak about ngapi, the pungent, spicy, fishy, chili-hot goo that we have been dipping our veggies in. 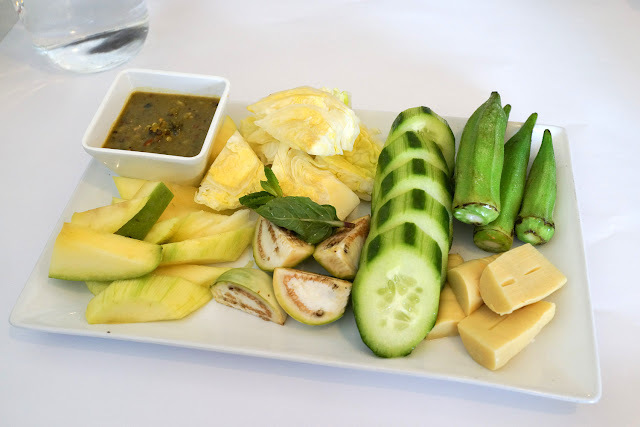 It's an usual flavour to us first-timers, but we are sure we'd grow to love it, just like as we did with Malaysia's belacan or Filipino bagoong. Green tomato salad - $10. 'Fresh green tomato salad dressed with dried prawns, fish sauce and chilli'. This salad is a cool and tangy, a nice counter to the spicier salads. Fish rice - $10. 'Fish and potato rice served with a tomato base sauce and roasted chilli'. These look and taste like arancini, with a gentle tomato sauce on the side. 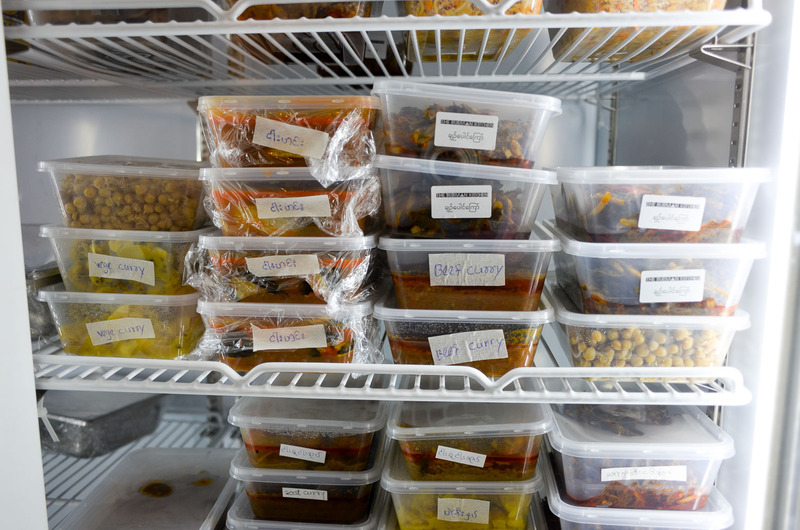 There's a bunch of ready-to-go dishes in the fridge. We've tried the chicken, veggie and goat curries, all are recommended. The Burmese semolina cake is must-try for all sweet tooths. 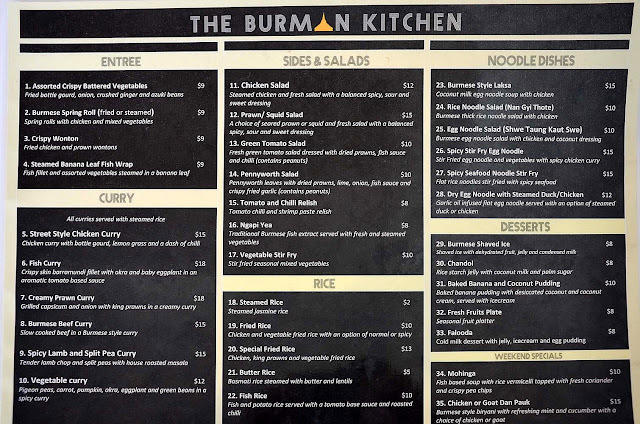 The Burman Kitchen menu - click to enlarge. The Burman Kitchen specials menu - click to enlarge. 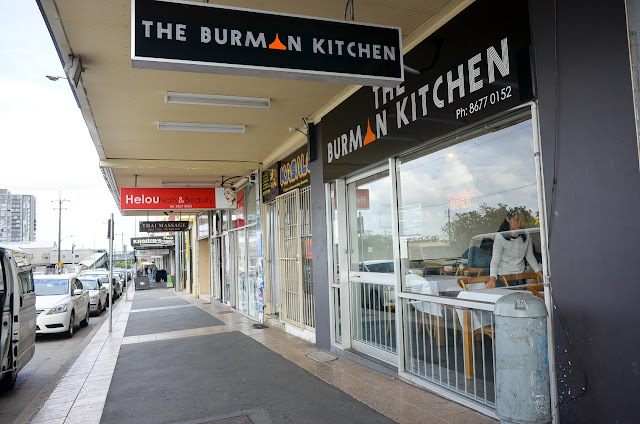 The Burman Kitchen is at 44 Railway Parade, Granville. Phone 8677 0152. Did we happen to mention we like this place? I am LOVING the increased pace of posting - so exciting! !